Healing crystals are believed to raise the vibrations of each other when they come together. Some stones become supercharged under the influence of another as all their properties are enhanced. But it is necessary to know what stones and minerals complement and amplify the energy of one another. Here is our simple guide to shungite crystal pairings that will bring you to the next level of crystal healing. 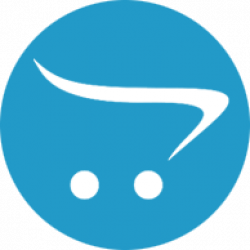 This crystal pairing is widely known for its high protective capacity. Garnet will fill you with courage and passion, while shungite will help to accumulate this energy and shield from the negative influence. 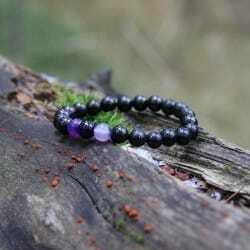 Besides, shungite and garnet are best Root chakra stones associating with loyalty and stability. Thus, this energizing duo will activate the survival center of your body where energy flows are initially raised. Clear quartz is the stone that clarifies the mind and body drawing off the negative energy. Shungite helps to regain the positive energy from the outside world attracting luck and good fortune. These stones together will improve your concentration and overall performance by restoring emotional and physical balance of the body. Red jasper and shungite seem to be the stones with opposite crystal vibrations. Red jasper has powerful fiery energy, while shungite is known for its calming and grounding effects. However, the stones symbolizing opposite energy poles usually complement the properties of one another. 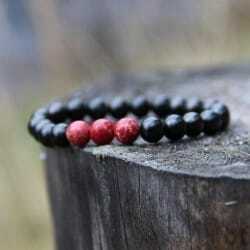 Red jasper and shungite pair is perfect for stabilizing. It reduces stress and anxiety and brings tranquility into the life of the owner. Moonstone boosts your intuition, inner strength and encourages spiritual development. But shungite helps to build a solid foundation for it balancing your Root chakra known as the first stage of the chakras ladder. Moonstone and shungite together forms a powerful crystal duo balancing the emotions, providing calmness and bringing harmony. 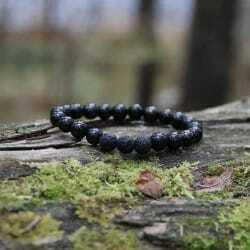 Both shungite and lava stone has calming, but intense energy and strong grounding properties. This crystal pair perfectly combines the energy of earth and fire. It will make you stronger and braver, increase the confidence and assertiveness. At the same time shungite and lava stone will bring stability into your life and help to establish connection with the earth. Purple agate fills you with enthusiasm and life-giving energy. 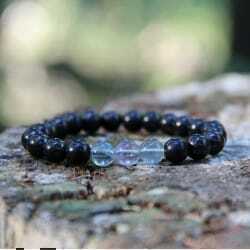 When its bold energy is paired with grounded shungite nature you fill stable and calm. This balancing crystal duo will help you to establish solid bonds with the outside world, understand yourself and the people around. Shungite and fluorite are incredibly protecting stones. This perfect crystal duo neutralizes any negative impact, cleanses the aura and stimulates energy flows within your body. Clear energy of fluorite enhances curative properties of shungite stone that will help you to maintain your physical and emotional health. This illustrative guide to the most potent crystal combinations has created the foundation for our unique Shungite Plus crystal bracelets collection. Wearing a stylish bracelet with matching stones you will amplify their energy and experience their metaphysical properties in full.